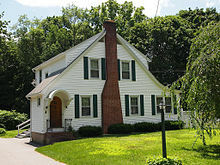 Dutch Colonial is a style of domestic architecture, primarily characterized by gambrel roofs having curved eaves along the length of the house. Modern versions built in the early 20th century are more accurately referred to as "Dutch Colonial Revival", a subtype of the Colonial Revival style. Wallabout Market in Brooklyn, designed by William Tubby in Dutch Colonial style in 1894–1896. The modern use of the term is to indicate a broad gambrel roof with flaring eaves that extend over the long sides, resembling a barn in construction. The early houses built by settlers were often a single room, with additions added to either end (or short side) and very often a porch along both long sides. Typically, walls were made of stone and a chimney was located on one or both ends. Common were double-hung sash windows with outward swinging wood shutters and a central double Dutch door. Settlers of the Dutch colonies in New York, Delaware, New Jersey, and western Connecticut built these homes in ways familiar to the regions of Europe from which they came, like the Low Countries, the Palatine parts of Germany, and Huguenot regions of France. Used for its modern meaning of "gambrel-roofed house", the term does not reflect the fact that housing styles in Dutch-founded communities in New York evolved over time. In the Hudson Valley, for example, the use of brick, or brick and stone is perhaps more characteristic of Dutch Colonial houses than is their use of a gambrel roof. In Albany and Ulster Counties, frame houses were almost unknown before 1776, while in Dutchess and Westchester Counties, the presence of a greater proportion of settlers with English roots popularised more construction of wood-frame houses. :22 After a period of log cabin and bank-dugout construction, the use of the inverted "V" roof shape was common. The gambrel roof was used later, predominantly between 1725 and 1775, although examples can be found from as early as 1705.:23 The general rule before 1776 was to build houses that were only one-and-a-half stories high, except in Albany, where there were a greater proportion of two-story houses. Fine examples of these houses can be found today, like those in the Huguenot Street Historic District of New Paltz, New York. In the American colonies both the Dutch and Germans plus others along the Rhine region of Europe contributed to the Dutch fashion. Three easily accessible examples of Dutch (Netherlands or German) architecture can be seen; 1.5 story 1676 Jan Martense Schenck House in the Brooklyn Museum, 1.5 story 1730s Schenck House located in the "Old Beth Page" Historic Village, and the two-story 1808 Gideon Tucker House at No. 2 White St at Broadway in Manhattan. All three represent distinctly Dutch (Netherlands-German) styles using "H-frame" for construction, wood clapboard, large rooms, double hung windows, off set front entry doors, sharply sloped roofs, and large "open" fireplaces. Often there is a Hipped roof, or curved eves, but not always. Barns in the Dutch-German fashion share the same attributes. Examples of hipped and not hipped roofs can be seen on the three examples provided above. The 1676 and 1730 Schenck houses are examples of Dutch houses with "H-frame" construction but without the "hipped" roof. The 1730 Schenck house has the distinctive "curved eves". Hips can be in a few different styles. The more common being a Mansard as known in Europe or "gambrel" as known in American English, both having two sloped on at least two sides. The Gideon Tucker (though an older Englishman) choose to build his house with a gambrel roof and in an urban Dutch-German fashion. Stepped gables on early 20th-century Dutch Revival buildings on S William Street in Lower Manhattan recall the Dutch origins of the city. Beginning in the late 19th century, America began to look back romantically upon its colonial roots and the country started reflecting this nostalgia in its architecture. Within this Colonial Revival, one of the more popular designs was a redux of features of the original Dutch Colonial. The term "Dutch Colonial" appeared sometime between 1920 and 1925. Within the context of architectural history, the more modern style is specifically defined as "Dutch Colonial Revival" to distinguish it from the original Dutch Colonial. However, this style was popularly known simply as Dutch Colonial, and this continues to be the case today. In New York, for instance, the actual 17th-century colonial architecture of New Amsterdam has completely vanished (lost in the fires of 1776 and 1835), leaving only archaeological remnants. Up and through the 1930s, Dutch Colonials were most popular in the Northeast. While the original design was always reflected, some details were updated such as the primary entryway moving from the end to the long side of the house. The more modern versions also varied a great deal with regard to materials used, architectural details, and size. For example, one Dutch Colonial might be a small two-story structure of 1,400 square feet (130 m2) with dormers bearing shed-like overhangs, while another larger example would have three stories and a grand entrance adorned with a transom and sidelights. Examples of urban style of Dutch Colonial Revival architecture can be found in Manhattan, New York. 57 Stone Street was rebuilt in 1903 by C. P. H. Gilbert on behest of the owner Amos F. Eno. The buildings to the back on South William Street 13–23 also were reconstructed in the Dutch revival style, evoking New Amsterdam with the use of red brick as building material and the features of stepped gables. Stepped gables on early 20th-century Dutch Revival buildings on S William Street in Lower Manhattan recall the Dutch origins of the city. The area was declared a historic district in 1996 by the New York City Landmarks Preservation Commission. The Children's Aid Society had a number of its centers constructed in the Dutch colonial revival style, such as the Rhinelander Children's Center at 350 East 88th Street, the 6th Street Industrial School on 630 East 6th Street, the Fourteenth Ward Industrial School at 256–258 Mott Street, and the Elizabeth Home for Girls at 307 East 12th Street. West End Avenue saw a large number of buildings designed in the Dutch colonial revival style. The West End Collegiate Church was modelled after the Vleeshal at the Grote Markt in Haarlem. Further examples in New York City are the former George S. Bowdoin Stable at 149 East 38th Street, 119 West 81st Street, and 18 West 37th Street. An industrial example was the Wallabout Market, designed by the architect William Tubby and constructed in 1894–1896. They were demolished in 1941 during World War II. Sunnyside in Tarrytown, New York, was partly constructed in Dutch Colonial revival. 112 Ocean Avenue, a Dutch Colonial home, became infamous as the site of the "Amityville Horror". ^ "Dutch Colonial". Realtor Mag. May 1, 2001. Retrieved December 18, 2018. ^ a b Helen Wilkinson Reynolds, Dutch Houses in the Hudson Valley Before 1776, Payson and Clarke Ltd. for the Holland Society of New York, 1929. Reprinted by Dover Publications Inc. 1965. ^ "Old Bethpage Village Restoration by James Robertson". PBase. ^ "WEST BROADWAY Part 2 - Forgotten New York". forgotten-ny.com. ^ "Dutch Colonial". Dictionary.com. 2018. Retrieved December 17, 2018. ^ "Map of Great Fire 1776". New York Public Library. Archived from the original on February 10, 2006. Retrieved December 17, 2018. ^ "Great Fire of 1835: Aftermath". Virtual New York. Retrieved December 17, 2018. ^ Gray, Christopher (December 27, 2012). "A Nod to New Amsterdam". The New York Times. Retrieved December 17, 2018. ^ Breiner, David M. (June 25, 1996). "Stone Street Historic District: designation report" (PDF). New York City Landmarks Preservation Commission. Archived from the original (PDF) on March 16, 2018. Retrieved December 17, 2018. ^ Gray, Christopher (January 30, 2009). "The School of the Stepped Gables". The New York Times. Retrieved December 17, 2018. ^ "Why are these Dutch-style houses on 37th Street?". Ephemeral New York. March 22, 2014. Retrieved December 17, 2018. Wikimedia Commons has media related to Dutch Colonial Revival architecture. Mitchell, Sarah E. (2007). "Colonial Homes with Gambrel Roofs". vintagedesigns.com. Retrieved December 18, 2018.